Angel Deverell: I quite like Shakespeare except when he’s trying to be funny. A group of girls march in succession toward their daily lesson, both their step and their outfits similar in fashion, until one girl breaks from the mold and finds herself at the gates of paradise, forced to gaze from afar. The girl is Angel, the title character from French director, Francois Ozon’s first venture into English-language film. Don’t let the name fool you though; there is nothing remotely angelic about her. She is spoiled, loud and delusional – everything you want in a heroine you’re supposed to root for and just the kind of person you want to see get everything they desire. Right? Angel is a writer, not a very good writer but people love her. She refuses to live in the real world in favor of the perfect illusion she believes she has crafted for herself. 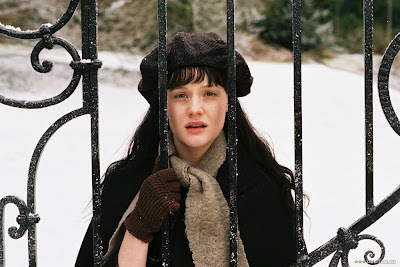 It all raises many questions about success and talent, sanity and vanity, but no matter how wickedly she is played by Romola Garai, the woman is too wretched to inspire sympathy in the viewer and Ozon does nothing to help. Ozon’s past efforts range in form from ridiculous and satirical to contemplative and tragic. His transition into the realm of period drama is daring considering the smaller size of his previous works but he juggles the elements well. In fact, he balances back and forth between the elaborate costumes, grandiose sets and exaggerated performances so well that it all feels rather plain. Considering how allergic Angel was to the mundane, I don’t think she would have been very pleased with this. And trust me, you wouldn’t like her mad.